A thought is something you think. 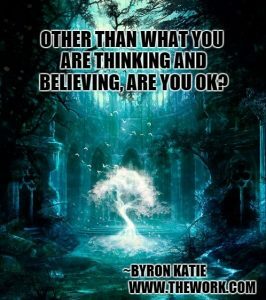 A belief is a thought you keep on thinking. A belief system is a multitude of beliefs that interconnect with each other and provide each other strength. As we have seen in the explanation on the five step cycle of creation; how our thoughts influence our reality, it is of vital important to be able to transform our thoughts, beliefs and belief systems that no longer serve us. 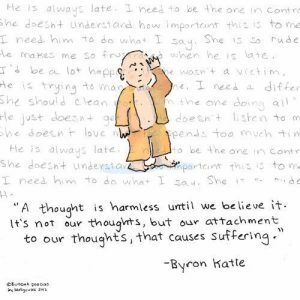 A great tool for this is The Work from Byron Katie. She has developed a very clear and simple technique that allows people to investigate, turn around and transform their stressful thoughts. She calls this process The Work and she explains the process in depth on her website for free. Both on YouTube and on her website you can watch many video’s for free with people doing the Work so you can get a feel for it. The examples go from relatively light stressful thoughts like your mother in law not liking your new shoes to very heavy ones like people losing their child in a car accident or dealing with heroin addiction. So even though Byron Katie looks like a sweet old lady, don’t be fooled by her appearance. She goes into the heavy stuff just as well and her method proves just as useful in those cases. In this playlist she explains the process in detail. And here an example of her work on a very common stressful subject; Money! She has also written several books about The Work that can help a person understand and apply the process better. So far I have not found a clearer, simpler or better working tool that enables people to investigate, turn around and transform their own bad feeling thoughts, beliefs and beliefs systems. It can take some time to get used to the process but like everything you get better at it with practice and once people see for themselves how they can learn from and transform their own stressful thoughts there is in a sense nothing to hold them back any longer. it’s your answers that help you. 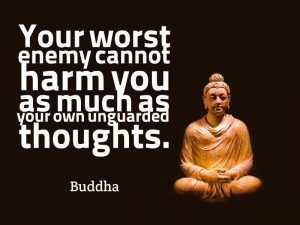 Your worst enemy cannot harm you as much as your own unguarded (and uninvestigated) thoughts. With this method that enables people to investigate, turn around and transform their (stressful) thoughts, beliefs and beliefs systems, combined with an understanding of how their thoughts influence their reality, people can really empower themselves. Whenever something is “off” in the external environment you can simply find the thought behind it and transform it. Doing The Work has brought me one step closer to inner peace with every stressful thought I investigated. This method gives every person a very precise description of a path they can walk towards inner peace, if they choose to. Yes, it hurts. And yet all suffering comes from unquestioned thinking and is pure imagination. Feel it? 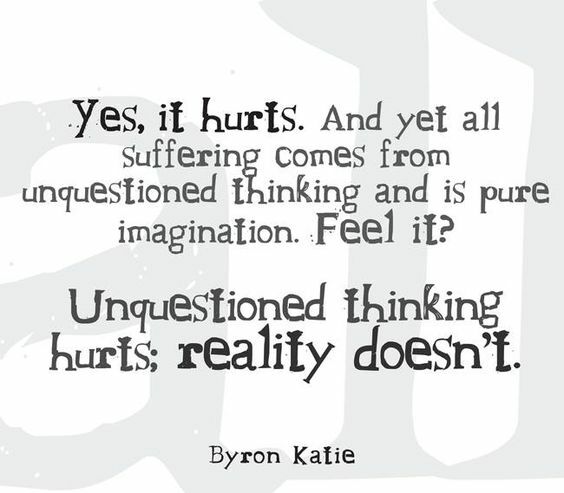 Unquestioned thinking hurts; reality doesn’t. Just a quick note: ” it is of vital important to be able to transform our thoughts, beliefs and beliefs systems if we want to change circumstances we do not prefer in our physical reality” – The Work is not about change – it is about acceptance. “You cannot let go of your thoughts – but once seen through – they let go of you” – this is paraphrasing Byron, but is essentially what she has said. There is no such as a ‘better’ thought – there is merely thought. ANY thought believed causes suffering. Period. I agree with what you are saying. I adjusted the wording a bit in the article. What I am referring to is how our thoughts influence our reality in the 5 step cycle of creation. As long as we have stressful thoughts it means that on some level we are resisting – what is – and are putting part of our energy in the resisting. If we are totally accepting and totally at peace with – what is – after having done the work on those thoughts and understanding and accepting it, then we can simply spend our energy on following our curiosity, interests and excitement fully because there is no resistance left. Once we accept – what is – fully, we change our state of being, our frequency. And once our state of being changes, our point of attraction changes and so what we attract in physical reality changes, which is a physical mirror image of our frequency/state of being. This might sound paradoxical but isn’t in my experience. So in a sense you aren’t trying to alter physical reality, you are altering your own state of being by fully accepting – what is – while before having done the work part of you was resisting it. By changing your state of being, the mirror cannot do anything else but reflect that new state of being back to you. I have found that doing the work is a great method to actually shift timelines because you remove “lower frequencies” out of your point of attraction because with the work you learn to accept and integrate them. The moment you do that there is no need anymore for the external mirror to reflect them back to you because you have integrated them and therefore the mirror can start showing you different stuff. The goal is not to shift the external world, but to shift your inner world, to shift your state of being. And once you do that, the physical reality cannot do anything else but reflect that internal shift in the externally experienced world. The darkness, the void, the space that the mind is terrified to enter, is the beginning of all life. It’s the womb of being. Fall in love with it, and when you do, it will immediately be taken from you, as you witness the birth of light. The Tao doesn’t take sides. It embraces both the darkness and the light. They’re equal. The Master can’t take sides. She’s in love with reality, and reality includes everything — both sides of everything. Her arms are open to it all. She finds everything in herself: all crimes, all holiness. She doesn’t see saints as saints or sinners as sinners; they’re just people who are suffering or not, believing their thoughts or not. She doesn’t see any difference between states of consciousness. What’s called bliss and what’s called ordinary mind are equal; one is not a higher state than the other. There’s nothing to strive for, nothing to leave behind. There’s only one, and not even that. It doesn’t matter how you attempt to be disconnected, that’s not a possibility. Believing a stressful thought is an attempt to break the connection. That’s why it feels so uncomfortable.